A Midlands teacher is hoping to help transform maths teaching in the region thanks to a fact finding trip to China. Faye Glendinning, Strategic Leader for Maths at Birmingham’s Cedars Academy, will spend two weeks in Shanghai as part of the nationwide Maths Hub exchange programme between England and China, representing the Midlands as part of the scheme. On her return to the UK, she will welcome counterparts from Shanghai to the Acocks Green based Cedars Academy, with more than 1,000 teachers from across the central region registering an interest to observe ‘showcase’ lessons taught by the Chinese teachers and ask questions about the teaching approach. The Shanghai approach to the teaching of maths is based around a ‘mastery’ approach, achieved by children developing a deep, secure and fluent understanding of mathematical concepts and the ability to apply their knowledge to a variety of problems. This whole-class approach ensures that no child is left behind. Misconceptions are addressed quickly and ‘slower graspers’ are supported with catch-up sessions to ensure everyone accesses the full curriculum at the same time. The first part of the two-way trip will see Faye sit in on maths lessons at some of Shanghai’s leading schools before taking on the challenge of teaching a class herself. Faye said: “It is an incredibly exciting opportunity for me to be heading off to China, I will be able to learn a lot from observing their methods and practices in person. “At Cedars Academy we are constantly evaluating our educational practices in order to get the best from our pupils and looking at effective and successful approaches globally can only help that. “China is renowned as a world leader in mathematics, so to be given access to classes in this particular part of the world is a real privilege. The exchange programme was initiated by the Department for Education in 2014 after a successful period for Shanghai students in the Programme for International Student Assessment (PISA) tables, where they regularly outperformed UK pupils. Cedars Academy has been working with the Central Maths Hub and the National Centre for Excellence in the Teaching of Mathematics (NCETM) for a number of years to develop its approach to maths teaching and learning. 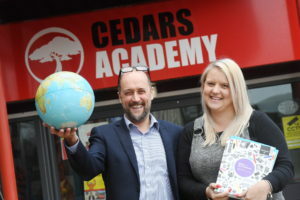 Joe Purnell, Head Teacher at Cedars Academy, believes Faye’s visit will be beneficial not just to their children, but to others across the region. He said: “For us it is a real privilege to be able to host the return visit, we are expecting that around 1,000 teachers will want to come and observe and ask questions at the ‘showcase’ lessons in January. “I have visited China in the past and seen for myself their approach to education, it is a really eye opening and thought provoking experience.